Anger, fear, and resentment are wonderful ways to motivate and radicalize a constituency. And so there's an episode in our history, long forgotten to most of America, that's on my mind as the political umbrage machine finds reasons to stir our fears this season. One of the major rallying cries for this upcoming election is this: Religious freedom is threatened. How? Well, there's an anecdote here, and a snopes-fail story there, but really? All that matters is that people are riled up enough to feel motivated. And sure, there are real threats to the freedom of religious practice elsewhere. In China, for example, where churches are forced to close for just being churches. Or in the Middle East, where being Christian means you may be tortured and beheaded. Our self-aggrandizing sense of "oppression" is an embarrassment to the faith, a mockery of the very real crosses borne by Christ followers around the world. "Tyranny?" Lord help us, we have no idea what that means, although the folks who are manipulating our fears would be happy to show us, I'm sure. That's not to say that religious freedom hasn't been challenged before in the United States. It has. When that's happened, though, and when it was resisted, what did that look like? What does defending your religious freedom look like in a constitutional republic, when it's genuinely at risk? For that, my research into the dynamics and lives of the Old Order Amish for my forthcoming novel surfaced an interesting case. There was a time, in the mid-20th century, when the Amish were jailed for their beliefs. It was the era when public education was increasingly a national priority. The United States was in the midst of the Cold War, and them Russkies were edumacating their young 'uns up real good. If we didn't develop a new generation of scientists and mathematicians and engineers, the Red Menace would overtake us with their Sputniks and their Soyuzes and their ICBMs. Next thing you know, we'd be singing the Internationale, watching terrible propaganda musicals, and being herded into interminable performances of abstract dance at the Bolshoi. So STEM education was the rule of the day, and everyone needed to be on board. School was mandatory. But a group of Wisconsin Amish refused to send their kids to school past eighth grade, on religious grounds. They were conservative Christian agrarian/craftsman pacifists, and they wanted to educate their children to be part of their community. They had nothing against literacy, because the Amish were and are avid readers and writers. They had nothing against math, in so far as you need some math to run a farm or a small business or a household. But the rest of modern-era public higher education was preparing their children for an economy in which they did not want to participate, an economy that was antithetical to their faith. So they refused. Their children simply didn't show up to class. Or, if forced to go to class, they'd flee into the cornfields. 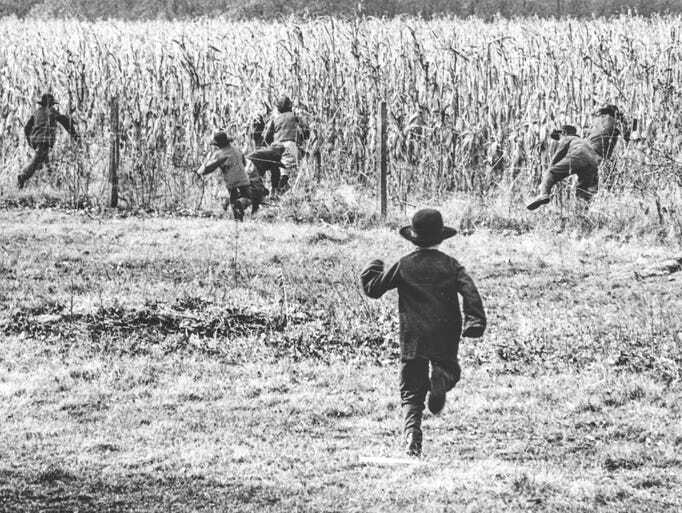 Amish parents were accused of encouraging truancy, of subverting the American way with their backwards ignorance. Charges were filed. The Amish held their ground. Amish elders were jailed, repeatedly, for breaking the law of the land. They maintained their position, relentlessly and peacefully, with the stubborn gentleness of that movement. Ultimately, they won. In 1972, the Supreme Court unanimously ruled in favor of the Old Order Amish, in a landmark decision establishing the rights of parents to see to the education of their young ones. But there's a detail in there, one that the current self-absorbed hullabaloo about religious freedom willfully ignores. The Amish were only interested in defending their way of life. They were not, in any way, imposing their way of life on others. I'd bold it and put it in all-caps, but hopefully, that point has been gotten across. What we "English" do did not matter to them. They had their way, their path, their Ordnung. Others were not expected to live by it, not coerced by the power of the state into living according to their rules. Now, I'm a fan of public education. Is it perfect? No, of course not. But it's a good thing, a public good, something that makes our nation better. Smarter. Stronger. Faster. Nonetheless, I can respect both the Amish position and the way in which they went about defending their inalienable rights. In a democratic republic, where your neighbor's freedom matters as much as your own, they showed us how defending religious liberty is done.